18650 2200mAh 3.7V Rechargeable flashlight battery. PCB protected with Raised Positive terminal. Lithium batteries hold more power than standard alkaline and are therefore the battery of choice for use in LED tactical flashlights. Depending on the LED flashlight you can get up to 4+ hours run time on a single charge. 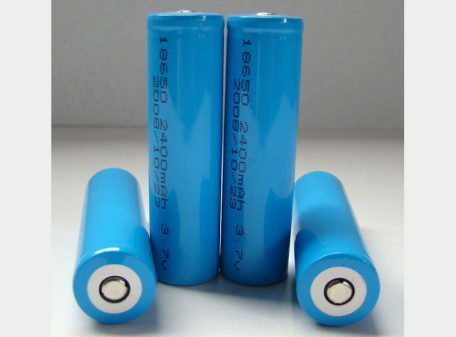 They are the size of 2-CR123 non-rechargeable lithium primary batteries and operate flashlights designed to run on 3V. This battery is for use in any LED Flashlight that accepts 18650 rechargeable batteries, and is for use on our following moldels; P.I., MK2, AEL280P, AEL280PI, AEL480HL, & AEL600 series LED flashlights. This battery has a Raised Positve contact terminal for use with flashlights that require it.